Lock in a great price for Hostellerie Baie Bleue – rated 8.2 by recent guests! We called at 6am to ask what time our room would be ready for check in and were told noon and adjusted our travel time to be there shortly after lunch. We're told our room was not ready at 2pm and we would have to wait til 3pm so we sat outside the room and it was ready after all since we arrived. Della the housekeeper let us in our room and ran to the desk to tell them the room was ready to go. Thanks for the great service Della! The hotel was beautifully situated overlooking the sea and had an inviting appearance. However, there was some serious construction going on within, which hampered access to certain areas and made accessibility to our rooms somewhat awkward. Once this work is completed, I think it will a completely awesome place to stay for a holiday. We liked the sea view. The rooms have been updated. No carpet. Free Wifi and a little fridge. Staff were very friendly and helpful. Excellent location to view nearby attractions. We rode on a tandem bicycle down an awesome nearby trail to see the sites. The room was updated and beautiful. The restraint was great. Plenty of parking. Nice walking path along the water. The food at restaurant was excellent. Rooms were clean and comfortable. Sunset was amazing! Kids enjoyed pool while husband and I enjoyed the view over a drink. Good food at restaurant. Right across the road from the beach and the boardwalk. Great white wine Sangria in the restaurant. Hostellerie Baie Bleue This rating is a reflection of how the property compares to the industry standard when it comes to price, facilities and services available. It's based on a self-evaluation by the property. Use this rating to help choose your stay! 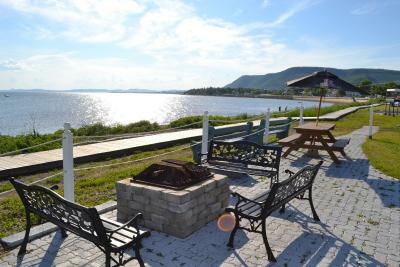 One of our top picks in Carleton-sur-Mer.Hostellerie Baie Bleue sits on the banks of Chaleur Bay. A heated outdoor pool is available during the summer season, from June to August. Rooms offer a view of the bay. Free WiFi is included. Rooms feature modern décor with dark hardwood floors at the Hostellerie Baie Bleue. A flat-screen cable TV and Keurig© coffee machine are available in all rooms. Small refrigerators are available in rooms of the mountainside pavilion. A private beach area is available for guests at the Baie Blue Hostellerie. Guests can take advantage of both the bay and the mountain areas with hiking and biking around the property. 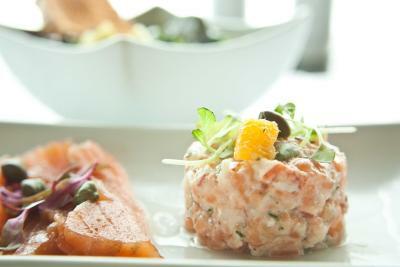 Restaurant La Seigneurie offers fine dining options and a breakfast buffet daily. Those who wish to socialize or watch a sporting event on TV can enjoy the festive atmosphere at Pub St-Joseph. 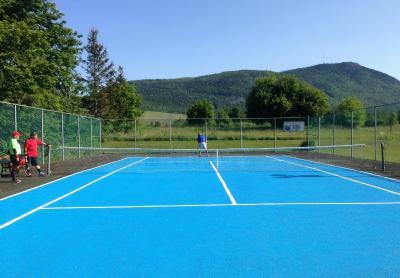 Hostellerie Baie Bleue is centrally located in Carleton-sur-Mer, by the sea, between Chaleur Bay and Mont Saint-Joseph. Germain-Deslauriers Park and Carleton-sur-Mer Marina are both less than 5 minutes' walk away. Miguasha National Park is less than 30 minutes’ drive away.. When would you like to stay at Hostellerie Baie Bleue? This room offers a mountain or ocean view and a flat-screen cable TV. It features hardwood floors, bathrobes, free Wi-Fi and a Keurig coffee maker. This spacious suite offers a sea view and includes a separate seating area with a sofa bed, a flat-screen cable TV and a small fridge. It includes hardwood floors, bathrobes, free Wi-Fi and a Keurig coffee maker. Free Wi-Fi, a flat-screen TV and wooden floors are featured in this room. It offers a work desk, bathrobes and Keurig coffee maker. This double room features a balcony, cable TV and bathrobe. This double room features a cable TV, private pool and air conditioning. This double room has a flat-screen TV, air conditioning and private pool. This double room features air conditioning, private pool and view. This suite has air conditioning, private pool and cable TV. House Rules Hostellerie Baie Bleue takes special requests – add in the next step! Hostellerie Baie Bleue accepts these cards and reserves the right to temporarily hold an amount prior to arrival. The pillows were too thick. If you can't manage stairs make sure you mentionned it. We had an akward step to get in and out of the room. The room was too hot. The thermostat to regulate the room temperature was not working. A while after figuring out (nobody explained) how to run the 'stand-alone cooler box'.. we stopped it because too noisy. We opened the windows but closed them shortly after because of the noise we can hear from the street (yes...! cars and trucks transit there after 11pm). Sleep came from tiredness. The pool was closed due to lack of staff bathroom too small no fan. Were told at check in that beach towels were available at the pool, were told at the pool the towels could not leave the pool area to be brought to the beach. My friend put on her hairdryer in the morning and we blew a fuse in the room as the air conditioner was on as well.